Installing the keyless entry system by itself wasn't that difficult. There were five wires: one ground, one battery power, one switched power, and then the lock and unlock wires. To connect the last two, just tie them into the lines coming from the passenger door; you don't need any relays. These wires from the door lock module, and have 12V present on them. The switch just connects them to ground. 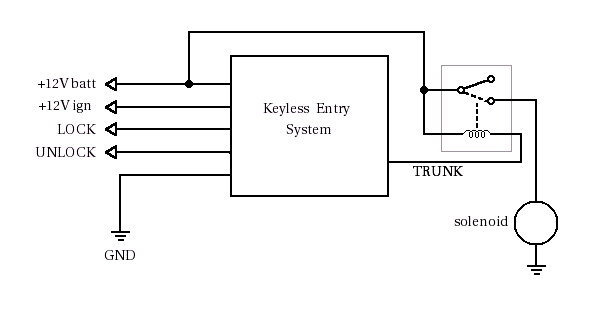 The keyless entry module does the same thing internally, so no extra relays are required. To install the trunk release solenoid, I had to install a relay, then run a wire from the front of the car to the trunk mechanism. To do this, I removed the plastic panel on the left side of the car and routed my wire along an existing harness. I also stuck it through the plastic harness guide that's under the carpet next to the driver's seat. Routing this wire was a real pain. I also had to install the solenoid next to the trunk mechanism, which required drilling two holes in the sheetmetal.